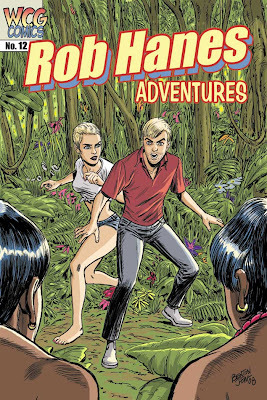 UPDATED 12/11/08: Since posting the image below of the cover to the next issue of Rob Hanes Adventures, I've since learned that the guest artist who drew the cover, Benton Jew, has recently had an 8-page story published in a Hulk Family one-shot, and has another story in the pipeline scheduled for Marvel's new wave of online comics! For details, visit Benton's Blog! And, of course, click on the image below to see his cover in detail! The cover above is by professional illustrator/storyboard artist/comic-book artist Benton Jew. More examples of this outstanding artist's work can be found at his blog. Benton is a professional acquaintance from way back, dating back to when he worked at George Lucas' visual effects company Industrial Light & Magic before going freelance. He is one of the finest artists I know. As noted in an earlier blog entry, in issue 12, Rob is stranded on a desert isle with a beautiful female felon he has been hired to extradite back to the United States from Japan after his plane goes down in the Pacific. Preview pages from the story may be found here.